any suggestions on the best brand of portable fish houses. How many people? Mobil or sit and Wait? Opinions are going to vary on this one.I like the Fish Traps for a few reasons. First they seem to be lighter than other comparable models.When you have to walk and drag it- it does become an issue.Second they have held up well for me And third is the convenience of just flipping it open or closed. I also like the lighter cover because it does let enough light in to tie jigs,etc.. Can save the light for night time. 2 people and it has to be moble. sled type or fold up is fine. it would be nice if there were room for 4 hole. I own a shoremaster sportsman 6x8 portable. It folds up into a 4x6 coffin. They have heavy canvas on them so they hold the heat in. There are 4 good size windows that have covers on them that let alot of light in during the day. It fishes 4 comfortably. The best thing about it is it is over 6' tall so you can stand up if you want and the doors on each end are D shaped so you can walk in without bending over. If you are looking for a flip over style I would check out Otter. They are well built but they are expensive. I own the Frabill XLTwin.. and love it.. its a pull over, only to seat 2. I have fished from several different portables and for me and my style the Otter medium with a Cabin top is the ultimate! I can either pull it by hand or with my snowmobile. It is tough enough to stand up to my 60 mile runs into the Canadian bush, pops up in seconds and is as mobile as you want. Otters come in several different sizes, the medium is perfect because it has a similar foot print as my snowmobile and doesn't hang up in the bush. On a scale of one to ten, I would rate it an eleven. ::)hello looking to buy a new shanty . got my eye on a fish trap ,but this otter sounds nice too. is there a web site? or who carries them? in northern ohio great lakes area. cabelas has built a new store in michigan,going to check there. Hello Big Mean! 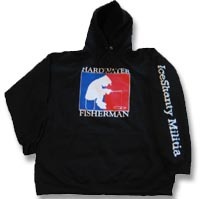 Check out www.otteroutdoors.com you can also find it at www.reedssports.com click on Winter fishing then click on Shelters. Big_Mean, I was at Cabelas last monday, they had lots of shantys set up, and were setting up more. I dont recall weather any Otters were set up, but they had lots of Otters stuff. I consider Cabelas in Dundee, Mi, my Mecca, I gotta get there every couple months or so. Its worth the trip wherever your from. Walkthrough aquariums, the trout stream winds through the clothing dept with huge rainbows swimming, at least 200 deer mounts, and full body mounts of about every animal alive including an elephant. Have you been there yet? Bushmaster, I think your on to something. I have a small OttersII. I should have looked at the shacks that bolt on. I built a cargo sled to pull with the snowmobile, but its kind of heavy. I take it you put all your gear in the sled, and the shanty bolts on top? I have a shappell, it pulls great on foot with the gear bungeed down on top, but, with the snowmobile, its a different story. Kenelz, Yep, the shanty portion bolts to the top of the otter. You also can buy a rigid hitch that bolts on as well. For me it is the best rig, takes a hell of a beating. I stow all my gear in there. There is the otter and the otter II, the II is the updated version. They have done a nice job with it. I have a Shappel it is nice and easy to setup and folds up good. has 2 doors so noone has to get up to let the other guy out. I would stay away from them ones that flip up to open, my friend used to have a clam and whenever someone got out any heat built up inside was lost right away. KENELZ, CABELAS DID HAVE ONE OTTER SET UP , A SMALL ONE. DOES NOT SLIDE.THE ESKIMO IS 70 $ CHEAPER THAN THE VOYAGER ,BUT I THINK IT WILL WORTH IT IN LONG RUN? HAD THE BISON RIDGE FOR LUNCH ,NOT AS MANY PEOPLE THERE AS I WOULD THOUGHT. THANKS AGAIN BIG MEAN. Big_Mean, did you end up buying the Voyager? Or are you still deciding? I had the same trouble last year, I kept going and sitting in each shanty trying do decide, balancing the weight,ease of setup, price, quality etc. I liked the larger ones better, but, stayed small, I fish by myself over 90% of the time, I settled on the Shappell 2000 deluxe. I like it, but, I think some of the others were better made. The price was right. 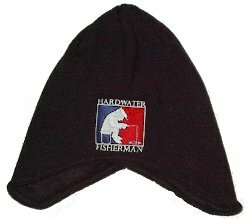 I was out today on a lake in Grand Travese county, I didnt bring a tie down, and the wind had me sailing across the ice, I will have one tomorrow. Run with the big dawgs,or stay on the porch! Big Mean,If your still looking for a portable ice shack and your still looking at the otter shelter you may want to look at this web site: www.canvascraftinc.com they have a massive 7'x12' size that fit on the otter sled.4 people can easily sit inside this shack.They also sell seat combinations that mount on poly sleds that I will be buying as I have an older fish trap that only has the bunk seat with no backrest.I've been using a folding canoe seat on mine but the seats at this site seam alot better.You know what they say"If you don't go first class don't get off the porch". Canvas Craft actually designed the Otter Sled and then they sold the design to Otter. They still make portables at Canvas Craft in fact a friend of mine told me he bought one from them last year that is mounted on the Otter Magnum sled. He went to Canvas Craft instead of Otter because he could get a heavier canvas than what Otter is putting on them. He loves the thing. Big Mean, Great! Glad you got the one you want. I can understand why Cabelas is having trouble stocking them, up here in Northern Lower, the ice has been great, because there hasnt been any snow. Good black ice everywhere. I have fished seven differnt lakes this year, all with good ice, its so smooth, ice skaters are out. I was on Houghton lake this morning, several pickup trucks on the ice, and two airplanes landed on the ice, one in front of the Limberlost (a bar restruaunt on the lake) he must have been real thrirsty! I fished Mitchell a couple weeks ago, it had 6 to 8 inches of ice then, about 3/4 mile out the "little cove", got lots of pike, mostly hammer handles. I did have my two keepers, and had a great time. The local fishermen on the ice said the walleyes are way down. Good luck when you fish it. 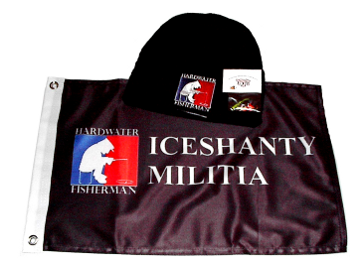 ice hard, so fish hard. but keep it fun. Well I can tell you that i have fished in the fish trap the clam and my cousin has a 6by 8 suite case style. I did a lot of looking and pricing and I bought the otter II lodge. you can sit in the tub, Fits two big guys just fine. (I am 6'2" 240and my cousin is 6'1" 260) it pulls very easy on ice. Better than the suite cases. has large tub for all of your gear with high sides. The old fish traps used to have high sides on thier tubs I think they shot themselves in the foot when they cut them down. As far as being expensive I found the otter to be competitive with the same size in other models. and it will handle the snow and was designed to be pulled by man or atv (with a bar kit, that you could make yourself) I really like it and they are made about 17 miles from my house. If you get one I have a few suggestion on how to put it together if you like and buy a extra adjustable pole for the door side. Holds down better with 2. The otter must be pretty good since i see fish traps and others for resale in classified adds but was unable to find the otter in a three month search. Well good luck with your purchase. I have a Frabill Cub Shak. Easy to set up and tear down. About 2 minutes to set up and tear down. It does pull kinda hard if there is snow on the ice. Has a tendancy to plow thru the snow. My buddy has a Clam Fish Trap Guide. Real nice shanty. easy to set up and tear down. It has ample storage for Gas auger and gear when moving around.Can be moved around real easy. Only draw back is it has no floor. Feet is right on the ice. My next shanty will probly be a Clam Fish Trap Guide.